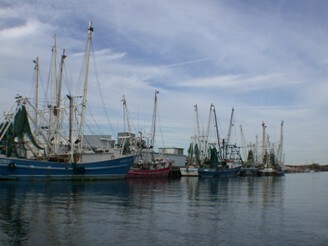 Known as the “Constitution City,” Port St. Joe is a coastal town with a colorful past and a promising future. Founded in 1835 as St. Joseph, the name given its bay by the Spaniards centuries earlier, it was here that delegates from all counties in Territorial Florida assembled in 1838 to draft Florida’s first State Constitution. Recently, Port St. Joe has transformed itself from a former mill town to a more tourist-friendly community. You’ll likely hear the soft drawl of southern accents but don’t let the region’s slow charm fool you. The port city is becoming recognized for its deep water access, new restaurants, inns and shopping, while maintaining a friendly, small-town atmosphere. Port St. Joe’s historic “main street” is taking part in the renaissance with a relaxed strolling, browsing and shopping area. And, within walking distance of downtown, visitors are increasingly discovering the new Marina Cove area. Marina Cove is adjacent to Port St. Joe’s new public marina and holds an expanding variety of shops and services. St. Joe Company also has some exciting things planned for Port St. Joe. If you have felt that gentle urge to kick your shoes off, relax, and enjoy the Undiscovered Florida, then discover the natural beauty and residential communities of Port St. Joe. Whether you're looking for a great place to relocate, or the perfect place to retire, Port St. Joe may be just what you're looking for.